Amid loud cheers from opposition members, three newly elected MPs, whose victories have given a fresh impetus to the BJP's opponents, took oath in the Lok Sabha today. 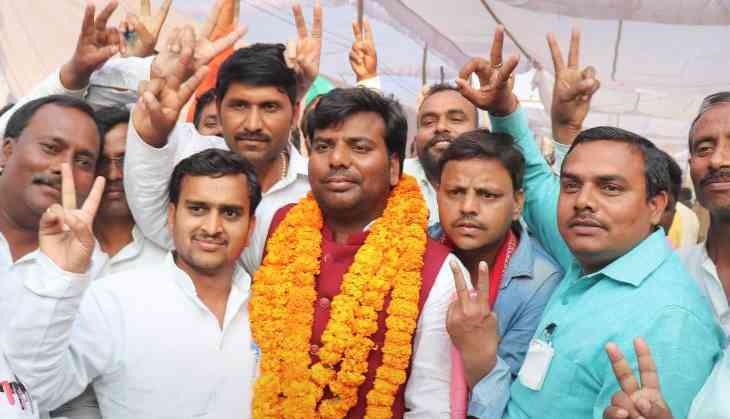 The new members -- one of the RJD and two from Samajwadi Party, defeated BJP candidates in the elections held last week. The members -- RJD's Sarfaraz Alam from Araria in Bihar, and SP's Nagendra Pratap Singh Patel, elected from Phulpur in Uttar Pradesh and Praveen Kumar Nishad from Gorakhpur constituency, took oath in Hindi. The SP members won from constituencies earlier held by Uttar Pradesh Chief Minister Adityanath and the Deputy Chief Minister K P Maurya. Alam (RJD) was the first to take oath amidst loud cheers by the opposition benches, which were occupied by several top leaders including Sonia Gandhi and Mallikarajun Kharge of the Congress and SP veteran Mulayam Singh Yadav. Home Minister Rajnath Singh, Finance Minister Arun Jaitley and BJP veteran L K Advani, who was seated in the front row of the treasury benches, also greeted him by thumping desks. Patel and Nishad, both sporting the trademark red cap of the Samajwadi Party, took an oath, were also cheered and greeted loudly by the opposition members. Both of them touched the feet of Rajnath Singh, Jaitley and Advani before taking an oath. While leaving the well, after signing the necessary papers, they took blessings from Mulayam Singh Yadav, Gandhi and Kharge. Speaker Sumitra Mahajan also greeted the three MPs. Alam defeated the BJP candidate in his home turf Araria, a seat which had fallen vacant due to the death of his father and former RJD strongman Taslimuddin. All SPs MPs, including Mulayam, Dharmendra Yadav, and Akshay Yadav, were sporting red caps. Before the House took up the day's business, the newly elected MPs were greeted by leaders of the opposition parties like Congress, TMC, Left, NCP, and others.